I’m pretty sure not everyone knows about Resorts World Manila. I knew that they had a really nice Casino with a buffet restaurant that serves delicious food. What I didn’t know was that they had two hotels, a huge casino, a mall, a theater and cinemas in their complex. Reminds me of Macau. Nice! I took my 13yo with me to the blogger’s night of the Grand Fiesta Run 2010. As expected, I was late so we weren’t able to enjoy the food at Passion restaurant in Maxim’s Hotel. My friends were raving about how good the food was. It’s a good thing that I didn’t miss the actual presscon. I’m so excited that RW Manila has organized a run to formally launch their complex. For one, this can actually be an alternative place to run. I always look forward to new places to train. 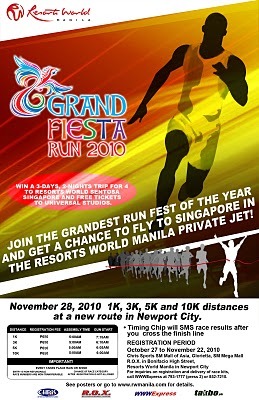 The Grand Fiesta Run 2010 will happen on November 28, 2010 at the Resorts World Manila complex. There will be four (4) distance categories – 1k, 3k, 5k and 10k. Prizes await for the Best Dressed, Most Unique, Biggest Group/Company, and Wildest Costume. Gun starts at: 6:00AM for 10K, 6:05AM for 5K, 6:10AM for 3K, and 7:15|AM for 1K. Get a shot at winning amazing raffle prizes! Resorts World Manila will be raffling off a 3D/2N stay at Resorts World Sentosa for four (4) with free tickets to Universal Studios OR a cruise for two (2) to Singapore and Malaysia and back to Singapore. Winners of the raffle will be brought to their destinations via the Resorts World Manila private jet! Yes you read it right! PRIVATE JET. How cool is that? For those who want to take an aim at a podium finish, check out what’s in store for you. Registration fee is P650 for all race categories. Register before November 22 at the following locations: Chris Sports (MOA, Glorietta and SM Megamall); ROX Bonifacio High Street and at RWM Tour Center. For more information, visit http://www.rwmanila.com, or call the RWM Tour Counter at (632)836-6333.